Which credit card offers the best complimentary travel insurance? 14 Comments on Which credit card offers the best complimentary travel insurance? Reviewing the complimentary travel insurance offered by credit cards. 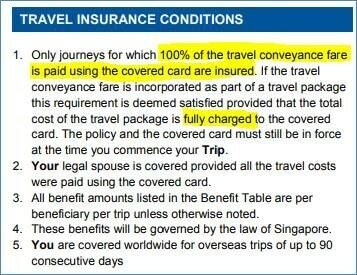 Glance through the publicity materials for any credit card in Singapore, and you’re likely to notice “complimentary travel insurance” cited as one of the perks. This perk is generally available to cardholders who charge the cost of their air tickets to their cards, and it’s not just limited to miles cards. Even cashback cards like the OCBC 365 and CIMB Visa Signature come with complimentary travel insurance too. So here’s a question I get a lot: which card has the “best” complimentary travel insurance? Unfortunately, the answer’s not so straightforward. Like everything in miles and points, it depends on what you’re looking for. It’s hard to give a definitive “best” because travel insurance policies differ in terms of their coverage amounts, coverage categories, age caps, trip caps, and a host of other factors. The situation gets even more complicated when you consider that cards from the same bank can have totally different policies (eg Citi Prestige and Citi PremierMiles have their policies provided by AIG and AXA respectively). To try and give a picture of what’s out there, I took a sample of miles and points cards and spent the weekend poring over the T&Cs. Underwriter Award Tickets? Age Cap Trip Cap (Days) One Way Tickets? The most fundamental question is whether you qualify for complimentary insurance in the first place. Most people think that so long as they charge their air tickets to their card, they’ll be covered. That’s generally true, but there are a few other things to consider: certain policies only cover round trip tickets, others cover two one-way tickets provided both are purchased before you step out of Singapore. Moreover, there are trip caps and age caps. Most of you won’t be affected by this, but if you’re above 60 or going on a trip that lasts more than 30 days you’re going to want to pay more attention to the fine print. The main variable I’m interested in is award tickets. Sad to say, my reading of the T&Cs is that most policies do not cover tickets redeemed with miles, even if you pay for the taxes and surcharges with your credit card. The policy states that 100% of the conveyance fare must be paid using the covered card. If you redeem your miles, you base fare is actually covered by the miles and your card is charged for taxes and surcharges only. Therefore the ticket is ineligible for coverage. One exception to this rule is Citibank cards. 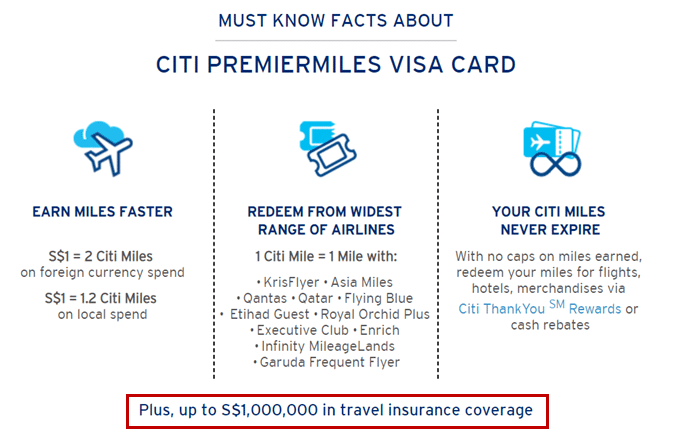 Both the Citibank PremierMiles Visa and Citi Prestige policies clearly state that award tickets are covered. The catch, if you want to call it that, is that your award ticket must have been redeemed with points earned from a rewards program associated with the Citi card. 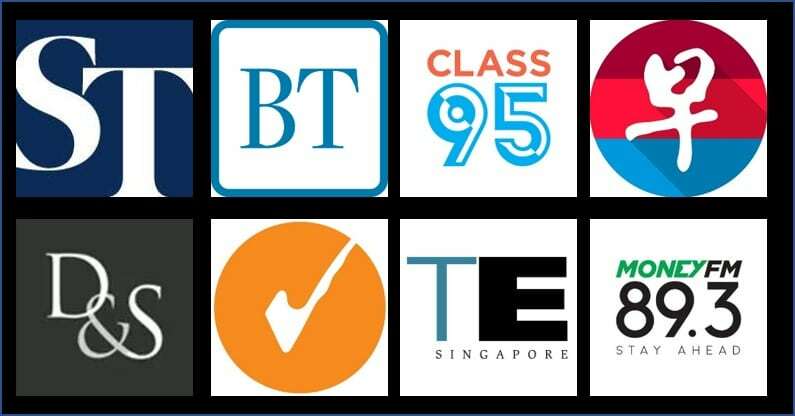 Fortunately Citibank has the widest range of airline transfer partners in Singapore with 12 different programs, so you should be well covered. That said, LifeMiles and Alaska MileagePlan are not transfer partners of Citibank in Singapore, so any ticket redeemed through those programs won’t be covered. What types of coverage are provided? There are three main types of coverage provided by complimentary travel insurance. Suppose John goes to Thailand and the airline loses his bag. He also loses an arm, as people are wont to do. He goes to a hospital for treatment before coming home. Assuming his insurance covers all three areas, he’ll get one payout for his baggage loss, a payout for losing his arm, and reimbursement for his medical bills in Thailand. There’s an important distinction here between accident and medical insurance. Although an accident will almost certainly entail medical bills, your policy may only cover the former, not the latter. Such is the case for the DBS Altitude, UOB PRVI Miles , Maybank Horizon and KrisFlyer Ascend. Here are the policy limits for accident and medical incidents. What type of travel inconvenience is covered? Trip cancellation is probably the most important coverage to have, as it protects you in case illness or some other misfortune prevents you from taking your trip. However, only the HSBC Visa Infinite provides any sort of substantive coverage here. Can credit card travel insurance replace stand alone travel insurance? The answer to this question really depends on which card you’re using. Some cards, like the DBS Altitude, offer bare bones coverage. Others, like the HSBC Visa Infinite, offer the type of coverage you’d expect from a stand alone travel insurance policy. Trip postponement, trip curtailment, trip diversions, loss of travel documents, rental car excess and even personal liability are covered. I would say that the vast majority of policies featured here are no replacement for dedicated travel insurance. These policies can be a “top up” in case of events which allow multiple claims (eg medical expenses can only be reimbursed by one policy, but your next of kin can claim for death on multiple policies), but should not be your primary coverage. In this article I’ve attempted to summarize some of the common areas of coverage among policies. However, you should definitely read through the policy of the relevant card to understand the coverage and exclusion in more detail. Not to forget other benefits like CDW for car rentals under the MasterCard WE travel insurance policy for the case of Citi Prestige. Hi Aaron, great article as always. With regards to the HSBC Visa Infinite not offering coverage of full/partial award tickets, that status quo will change beginning 1 October 2018. Great to hear! Thanks for letting me know. Great Summary on coverages! I did my own research few months back and narrowed down to Citi having the best coverages (i.e. from the few cards that I own) – but always safer I feel to have stand-alone Annual Travel Insurance Covers. (Great deals out there nowadays!) I enjoyed reading! Agree with Beem 100%.. If it is ‘protection’ that one is looking for, best research “what’s best for you” in standalone annual plans and have much better ease of mind because, at the end of the day, one has to realise that any free plan, would be ‘tagged’ towards using the card in question, and if not, there’s no reason for the card company to simply give out free candy for nothing.. I recently spoke to AXA in relation to the cover offered in relation to the Citi Premier Miles card Interestingly while the Accident and Medical cover extends to family members, the Travel Inconvenience cover is limited only to the card holder. Hi Aaron, what it means by “miles earned need to be associated with citi program” ? My miles/points are coming from different banks to covert to KF miles. Will this affect the insurance validity if I were to purchase award ticket, by using citi card to pay tax portion? Thanks Aaron for your prompt reply! !